Jack McMurdo of St Cuthbert's chases down Newton Stewart's Thomas Garrett. The first round of the Tweedie Cup matches were scheduled to take centre stage last Saturday but the heavy rain put paid to all but two of the cup-ties. The matches at Blairmount and Dumfries High School went ahead with both being played on parks fitted with artificial grass surfaces. Newton Stewart recorded the result of the day when they defeated strong favourites St Cuthbert Wanderers by the odd goal in three in a very entertaining match at Blairmount Park. Free scoring midfielder Johnny Fisher put Newton ahead before Andrew Donely squared the match. The Creesiders dominated play for long spells and after going close several times striker Robert Middleton found his scoring touch with a superb swerving shot for a goal that proved to be the winner to take the home side into round two of this particular competition. Heston Rovers found their scoring boots in their match against neighbours Abbey Vale when they progressed to round two by virtue of a four goals to two victory although going behind with only half an hour left to play. Russel Jardine opened the scoring for Heston in the 34th minute but three minutes later Vales Dylan Cairnie levelled the contest. With an hour played Kevin Neilson restored Vales lead with Craig Adamson again squaring the match from the penalty spot. 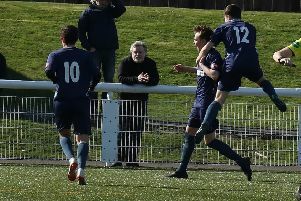 A Gary Tweedie header in the 74th minute put the visitors ahead for the first time in the match and in the final minute Jardine found the net again to ensure victory for Heston Rovers. In the South of Scotland League Creetown put up a great fight against Edusport Academy at Galabank, Annan but in the end went down 2-0 to the league leaders, but by all accounts were unlucky to not take something from the match. All other matches were postponed due to water-logged pitches with Mid-Annandales 3G pitch suffering from the same fate that Newton Stewart suffered from last season.